You choose the menu, you choose dessert! No two parties are ever alike! Our energetic instructor leads you through a 1&1⁄2 hour event with recipes, activities, and guests make their very own party food! If school is out, Culinary Kids is IN! Day camp adventures serve kids ages 5 – 13. We get to cook our meals, enjoy wild science experiments, indoor/outdoor games, crafting, exercising, shopping & guest visitors! We also offer week-long, full day sessions (9am -3pm) during Spring Break and Summer, May through August. Daily camps run during ALL school holidays and breaks. Pre-school through High School! Apply classroom learning and practice life skills with professional educators while making lunch! We teach healthy choices, good manners and safe, clean kitchen practices with an age-appropriate approach. Drop off kids ages 5 and up to for this monthly 3 –hour Friday night KIDS ONLY PARTY! Kids enjoy a movie-themed cooking class, whip up a hot meal, make creative desserts and play wacky games while having fun with friends! Adult instructors provide a safe, closely supervised environment. Under the guidance of Culinary Kids staff, led by professional teaching chef Brooke Berry, students ages 10 - 18 will learn professional food preparation and practice detailed skills and techniques used by certified chefs. Students will practice topics like knife skills, measurements and conversions, ServeSafe food handling practices, herb-spice-ingredient identification, palette expansion, and nutrition. Students will be introduced to specific cooking techniques such as sautéing, braising, broiling, frying, roasting, grilling, baking, stewing and MORE in a detailed practice setting. We offer two options for people with varied abilities (special needs). Weekly classes offer opportunities to develop social skills, independent living skills, cooking techniques, kitchen safety and vocational skills while having a great deal of FUN with our qualified and credentialed staff. One-stop spot for badge requirements! All programs follow current national handbook guidelines. Each scout is badge-ready at completion of the program! 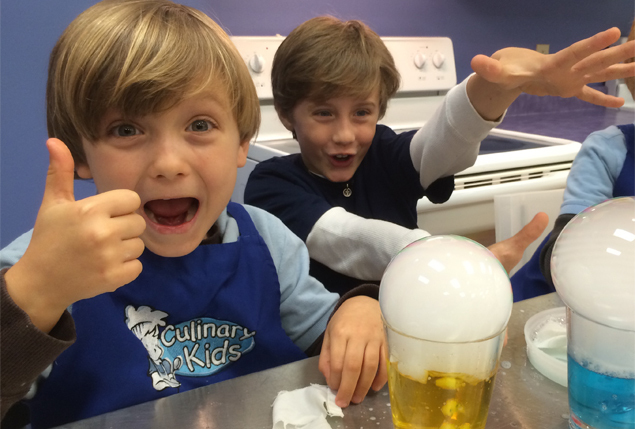 Bring the kids in for an age-appropriate, custom-designed cooking and kitchen science experience! Fees vary, $16 - $25 per student (cost based on selected menu, 20 kids minimum). Contact us for more information. Do you need a creative night out with the ladies? Bosses, do you need to "WOW" your staff with a unique appreciation party? If you have ideas, we can cook up something unique! Cost varies according to menu, contact us with requests.